In hopes of sending them as a token of his appreciation to those who have supported the cultural exchange, Okinawa Brazil Network Amigo Association President Akihiro Yonashiro, age 74, has been growing more than 200 pots of Ipe, or purple trumpet trees, at his home in Motobu, Haebaru. The association fosters exchange between Okinawa and Brazil. Yonashiro’s also considering asking for help with the cultivation if there are people who are interested in supporting the cultural exchange with Brazil. 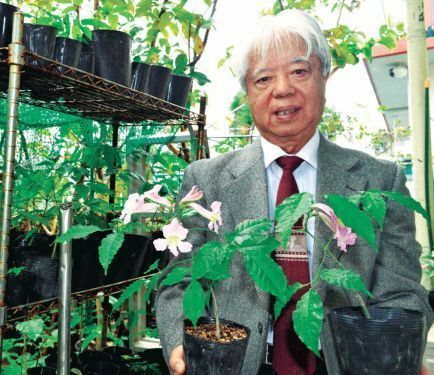 Last April, Yonashiro discovered pretty purple Ipe flowers at the family home of the late Okinawa Brazil Association President Kiyonori Miyagi. After receiving a copious amount of seeds from Miyagi’s family, Yonashiro planted them in May. The Ipe at Yonashiro’s home are now between 20 to 30 cm and continue to grow. Over the course of 50 years, Yonashiro utilized his position as a travel agent to interact with Okinawan-Brazilians and also served as the executive director for the Okinawa Brazil Association. This year will make 110 years since the first Okinawans immigrated to Brazil in 1908. Yonashiro pointed out the changes in Brazil’s society. Besides sending them as a gift to the donators, the yields from selling the purple Ipe will in turn be used for donations. For more information, please contact the Okinawa Brazil Network Amigo Association at 098 (867) 3304.